One week ago, Halloween season began when we drove to our favorite theatre in Greensboro, GA to watch Fright Night in 3D. My apologies for taking so long to write up a review. Honestly, I haven’t known what to write about, because I didn’t want to spoil a single thing about this movie. Fright Night is the best movie I’ve seen all year, including both theatre watches (Scream 4, Horrible Bosses) and movie rentals at home (Pirahna, The Social Network, and many many others—you know how many movies I watch). No sarcasm here. I am completely serious. 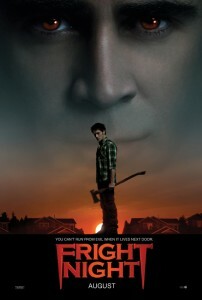 Fright Night is a movie that I came out of surprised, excited, and elated. I could’ve gone back into the theatre and watched it again immediately. Here is your brief summary of both the original and remake of Fright Night: A boy realizes that his next door neighbor is a vampire. Pretty basic premise, right? I watched the original Fright Night, starring Chris Sarandon (who many of you know as Prince Humperdink in The Princess Bride), one or two Halloweens ago. I’m not sure if I had seen it on TV sometime before then, but it does feel like one of those “familiar’ movies like I must’ve seen it before. This isn’t a horror classic that we own in our collection. Derrick isn’t too fond of it (or 80s vampire movies in general), and I thought that much of the movie was forgettable. Fright Night’s main redeeming quality is that is has one of the greatest final battle scenes out of any scary movie I’ve ever seen, when it breaks out of the scary movie genre and becomes an action movie. The new Fright Night did exactly what it needed to do in an awesome revamp that I can only compare to The Crazies revamp that came out in 2010. Fright Night took a movie that was only so-so, and it turned it into something fantastic. Even Derrick was blown away. While the original only had one real star, this version had many. Every single actor was phenomenal, from Colin Farrell to Toni Collette to David Tennant. For me, Christopher Mintz-Plasse stole the show, and I’m not just saying that because he is my hyphenated-brother. I know I’m in the minority here, but I hated Superbad. I was a little freaked out when I heard that McLovin was going to be in a scary movie. But his role as the sidekick in this movie was both hilarious and horrifying all at once. I really hope that he continues to take these kinds of roles instead of the McLovin kind. This is our first 3D theatre experience, and I completely recommend seeing it in 3D if possible. I guarantee you that it is still just as good of a movie if you have to see the “regular” version, but the 3D just makes it cool. They were very creative with how they utilized the effects, and there was only one shot (a bucket thrown through a glass door) that felt gimmicky. 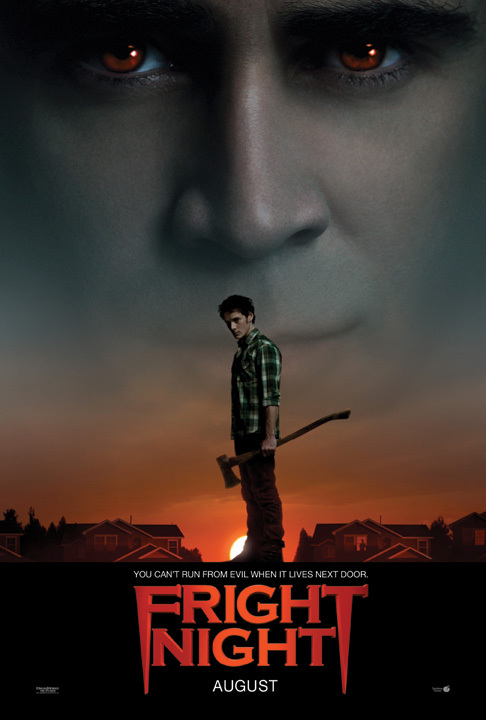 The team who worked on this movie obviously enjoyed the original Fright Night, wanting to pay homage to it while still incorporating the 3D element to make this movie fun for the audience. Ten thumbs up. Go see it today! And if you take my recommendation and agree that this movie rocks, feel free to send us money for two tickets as thanks. Derrick and I would love to see it again. Did I mention it’s a Vegas movie? You know that’s our city!